We recommend checking out our discussion threads on the Grass Valley T2 Pro Intelligent Digital Disk Recorder 608410, which address similar problems with connecting and setting up Solid State/HDD Recorders Grass Valley. The user manual for the Grass Valley T2 Pro Intelligent Digital Disk Recorder 608410 provides necessary instructions for the proper use of the product Professional Video - Recorders & Duplication - Solid State/HDD Recorders. The T2 Pro Intelligent Digital Disk Recorder from Grass Valley comes with four 500GB HDDs and brings full high-definition capture and playback to the video professional. Additionally, it supports real-time HD cross conversion and faster than real-time playlist rendering. This recorder is a complete and self-contained SD and HD audio/video playout center. The front-panel transport controls have the look and feel of traditional VTRs, and its 2 output and 1 record channels support SD and HD content. The crisp and clear LCD front panel can display high-quality images and is complemented by a software application suite for managing and selecting media clips, clip editing, and trimming, and playout; including playlist creation. Featuring extensive rear-panel audio/video connectivity, it can also accept files via a USB 2.0 or by data transfer over a standard Gigabit Ethernet network. It also accepts media from other applications including HQ AVI, MPEG-2, QuickTime, Windows Media Video HD, JPEG, TIFF, TARGA, and BMP files. With the T2 iDDR (Intelligent Digital Disk Recorder), you can exchange content at high speed over a network or via removable media such as an SSD through a USB or the dedicated 2.5” (63.5mm) HDD slot. 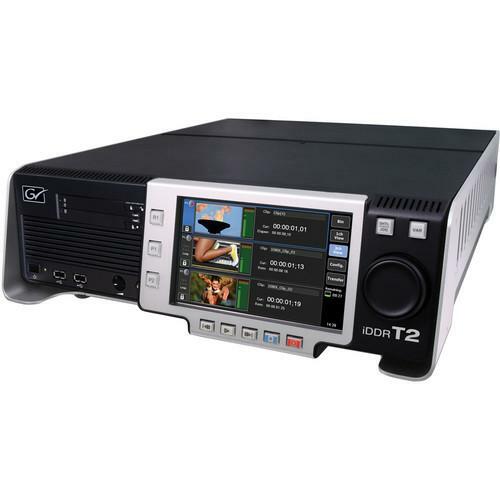 Further, the T2 iDDR can be controlled by the Indigo A/V mixer, combining features normally found in video production switchers, presentation mixers, and audio mixers, to create a powerful presentation system. It has 2 playout channels for independent editing and previewing, or for delivering content to 2 different display systems simultaneously, including left-eye/right-eye 3D content. If you own a Grass Valley solid state/hdd recorders and have a user manual in electronic form, you can upload it to this website using the link on the right side of the screen. Box Dimensions (LxWxH) 27.75 x 22.0 x 10.0"
The user manual for the Grass Valley T2 Pro Intelligent Digital Disk Recorder 608410 can be downloaded in .pdf format if it did not come with your new solid state/hdd recorders, although the seller is required to supply one. It is also quite common that customers throw out the user manual with the box, or put the CD away somewhere and then can’t find it. That’s why we and other Grass Valley users keep a unique electronic library for Grass Valley solid state/hdd recorderss, where you can use our link to download the user manual for the Grass Valley T2 Pro Intelligent Digital Disk Recorder 608410. The user manual lists all of the functions of the Grass Valley T2 Pro Intelligent Digital Disk Recorder 608410, all the basic and advanced features and tells you how to use the solid state/hdd recorders. The manual also provides troubleshooting for common problems. Even greater detail is provided by the service manual, which is not typically shipped with the product, but which can often be downloaded from Grass Valley service. If you want to help expand our database, you can upload a link to this website to download a user manual or service manual, ideally in .pdf format. These pages are created by you – users of the Grass Valley T2 Pro Intelligent Digital Disk Recorder 608410. User manuals are also available on the Grass Valley website under Professional Video - Recorders & Duplication - Solid State/HDD Recorders.